Dimensions: ↑ 10,2 cm. ; ø corpus 6,5 cm. ; ø rim 5,7 cm. ; weight 75,5 gram. 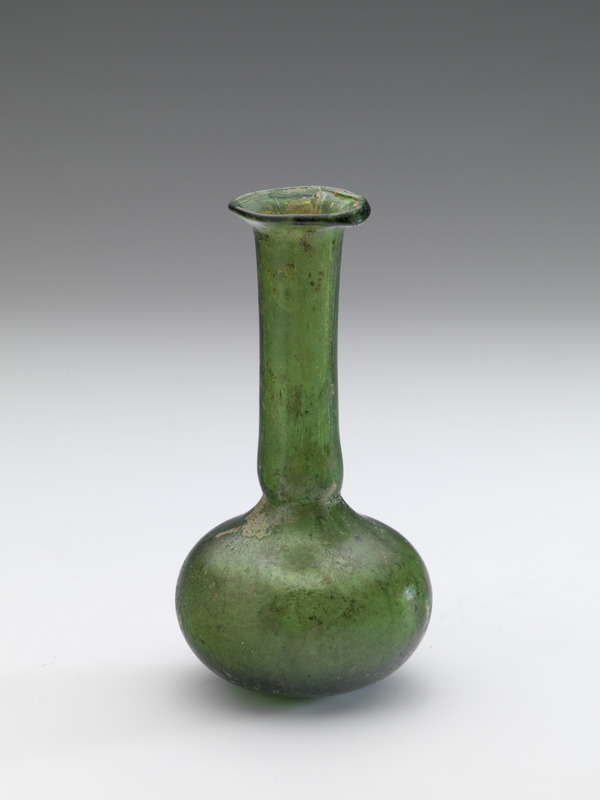 Description: Roman free blown flask made from olive green glass. The corpus of the body is of a somewhat flattened bulbous form. The bottom has a kick-in base with a visible pontil mark. At the shoulder of the corpus two handles have been attached. These having the typical form for the area in which these objects were made being loops first attached to the corpus and than with multiple loops pulled out to the neck connecting to the multi-spiral thread around the top of the neck. The handles differ in form where the one on the right in this picture is more fragile in form than the other. The splayed out rim has on the underside an additional glass thread to provide extra strength to the rim. The outer edge of the rim has been folded inward. – in owners collection since 2009. Description: Translucent green glass, elegant pear-shaped body, tapering into a long cylindrical neck flaring slightly at the mouth. Funnel shaped mouth with rounded rim, folded outward. Short folded stemmed foot with solid ball knob and small rest of pontil mark. A fine spiral thread wound around the top-part of the neck. Remarks: To form the neck the glass blower probably used a ribbed hand-held tool of which the traces are still visible. Technique: Cylindrical neck, ovoid body blown in two part moulds, (Stern:MCTVIII). One continuous mould seam extends across underside of base. Handles applied. No pontil mark. 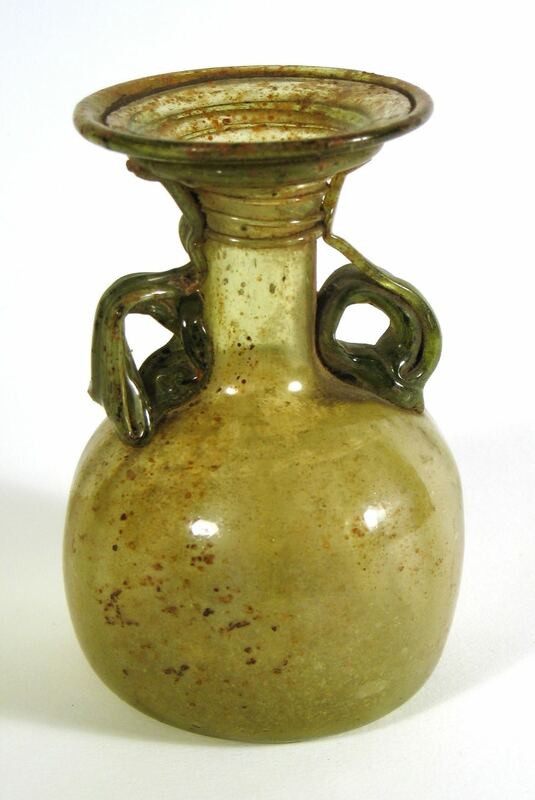 Description: Bulbous opaque blue bottle with two dark green handles; some green glass washed down the blue body during production; decoration with a band of scrolls between vertical flutes or tongues. Condition: Repaired from two pieces, one the corpus, the other an oval crack from neck to mid body, in stable and complete condition. Remarks: Syro-Palestinian, perhaps from Italy (according to Whitehouse quoting Stern).‘The type itself appears to be a minitiature version of a large mouldblown amphoriskos, such as the one bearing the name of Ennion in the Hermitage Museum’ (according to Stern, see Kunina: 1997, p. 27, no: 109). Place of manufacture: Probably Italy. Considered to be from the same workshop as the example in the British Museum. Technique: Historically described as cast and cut but the modern school of thought suggests that these were blown and then ground and polished when cold. The example in the British Museum is described as blown. I am inclined to go with the blown theory. The same shapes are made in transparent glass which are obviously blown but the glass in those cases is thinner. 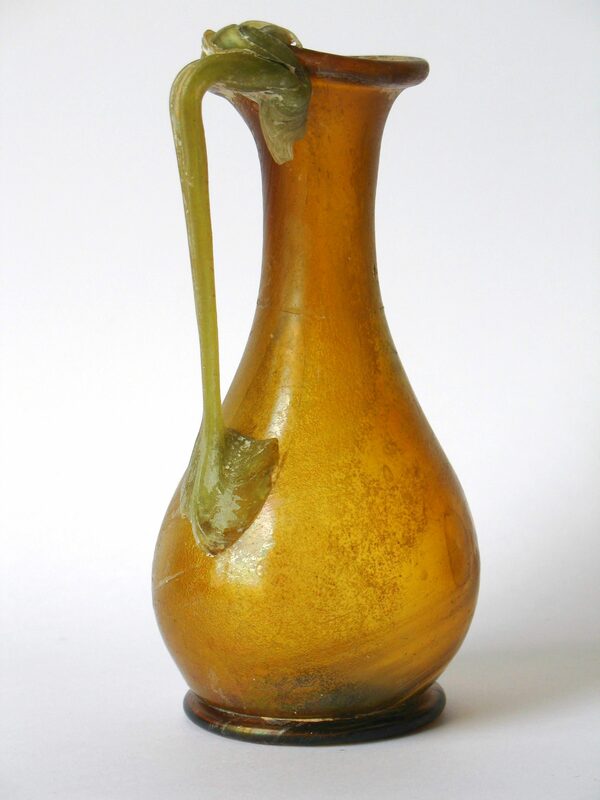 This vessel would have required thicker glass to allow for cutting and so the glass maker may have started with a thick rectangular sheet of glass and picked it up and folded it round on the iron before blowing. This process in itself would explain the need for subsequent grinding and polishing to remove any irregularities or rough exterior from when the sheet was formed, regardless of the cut band decoration. This is the technique used to make the mosaic gold band glass bottles. Whilst the idea of casting this particular form of vessel would seem to be unlikely, nevertheless it would have been a more complicated technique than simple blowing and the skill and work involved would have put these vessels into the luxury category. Rarity: This is a rare form in cut opaque glass. Only about 8 extant examples are known of in private and public collections Worldwide. They are found in three opaque colors: red, blue and white. Obviously luxury items. Provenance: Ex collection of Dr. Alexander Gonik, Switzerland 1960’/1970’s. Reference: Benzian collection Sotheby’s 7 July 1994, two examples in white and red. ,Constable Maxwell collection Sotheby’s June 1979, two example in red., British Rail collection Sotheby’s 24 November 1997 example in red (from the Constable Maxwell collection). Late 5th – early 6th century AD. Western Roman Empire. H 12.0 cm. Drim 7.5 cm. Dbase 2.6 cm. Weight 77 gr. Transparent natural green, bubbly glass. White trail. The mold-blown body (blown in dip-mold) covered with diagonal ribbing from lower right to upper left. Ribbing starts at approx. 2 cm above bottom. Rim fire rounded and slightly thickened. Conical wall tapering to slightly turned-in base. Annular pontil mark at base. A white trail spiralling horizontally around the neck just below the rim in thirteen revolutions. After the collapse of the Roman Empire the Frankish taste in glass changed: cutting, engraving and enamelling disappeared and simpler shapes and decorative styles prevailed. 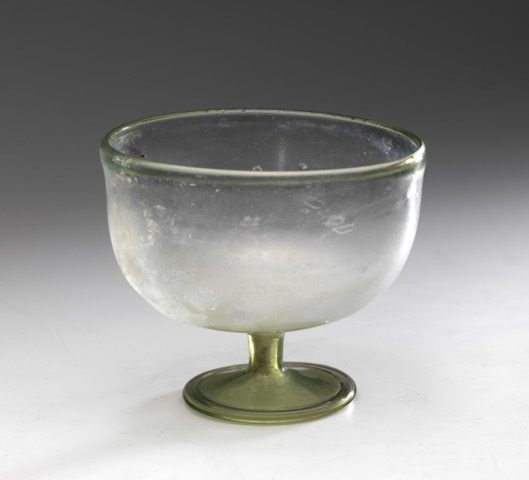 Frankish (Merovingian) glass was mainly produced at the furnace. 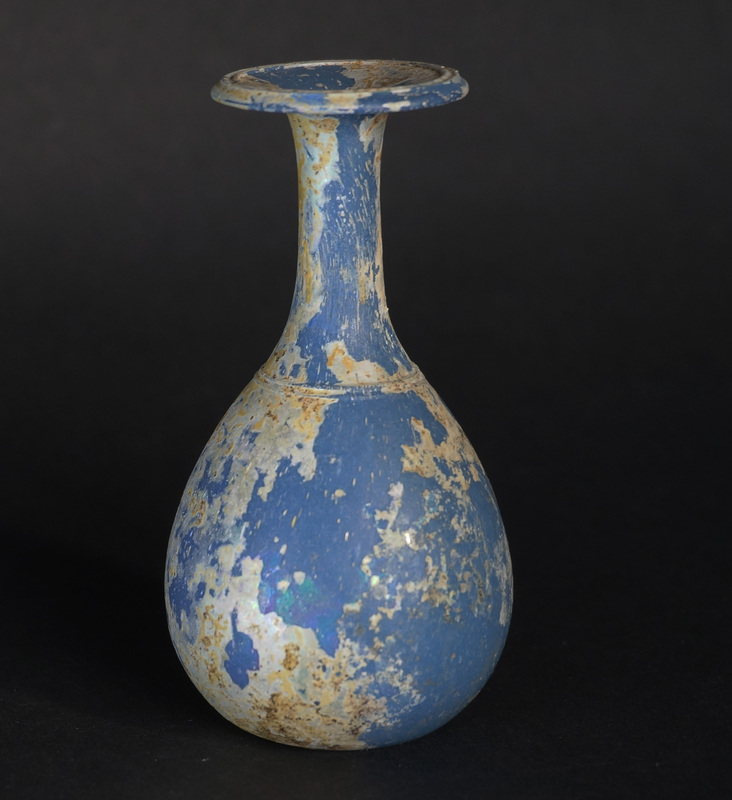 This beaker is an outstanding example of the less sophisticated techniques of the Franks. The lack of a firm base on this beaker implies, that the liquid must have been consumed before the beaker was placed rim down on the table. Dr. Fischer Kunstauktionen 19 October 2015, No. 4. Loudmer 1985, Collection Monsieur D., Nos. 515-516. Whitehouse 2001, Corning Museum, No. 669. Collection John and Carole Allaire, No. 60E. 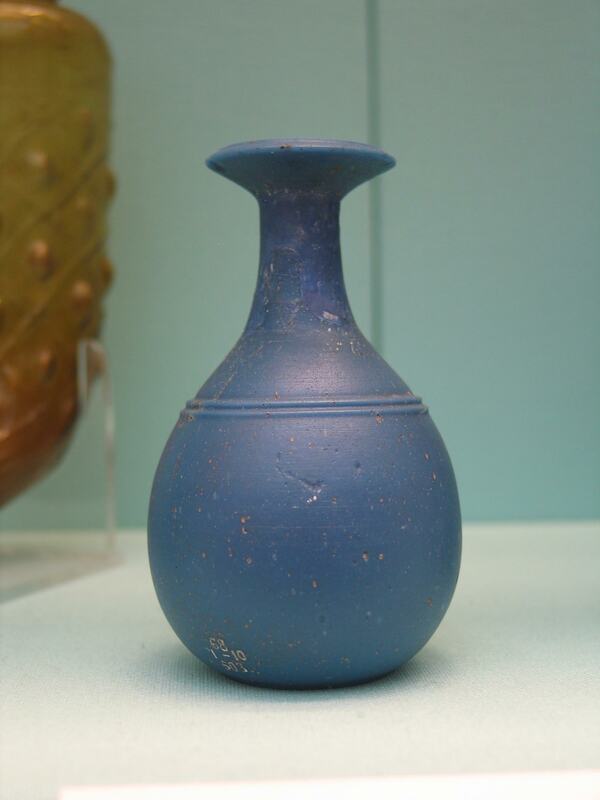 Description: This large thick-walled jar (with irregularly drawn-up yellowish-green handles) has been found in the Rhineland (Germany), possibly imported from the Eastern Empire. Could be used for storage, probably later on also for cinerary purpose . See comment ‘Romeins Glas uit particulier bezit’. Classification: Variant of Isings (1957) form 6 and form 26 a. Description: Transparent emeraldgreen glass. Squat bulbous body. Striking long tubular neck with constriction at bottom. Rim folded outward, upward and inward. Flat base, slightly indented. No pontil mark. Condition: Intact with some weathering. 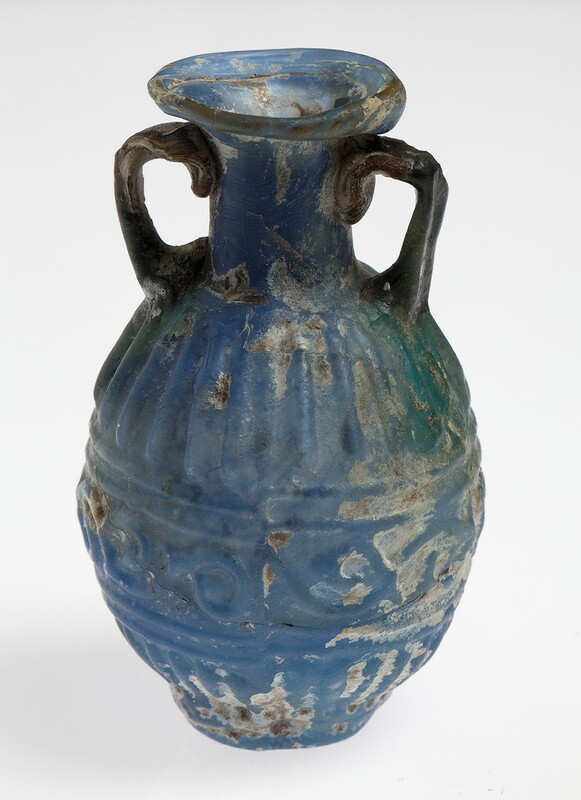 Remarks: This Roman perfume bottle is rare because of two reasons: the form and the colour. Only very few unguentaria of this form (with a very long tubular neck) have been founded. 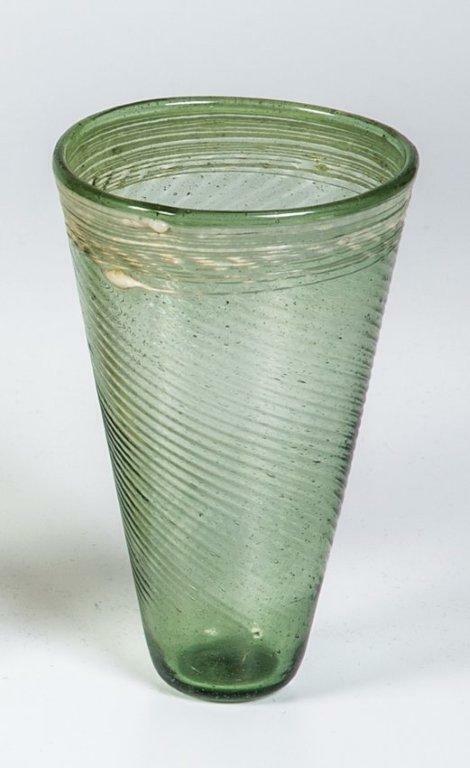 Emeraldgreen is the least common colour in Roman glass. The colour has been achieved by addition of some percents iron oxide into bluish-green glass. Provenance: 2006 Jürgen Haering Galerie am Museum, Freiburg (Germany). 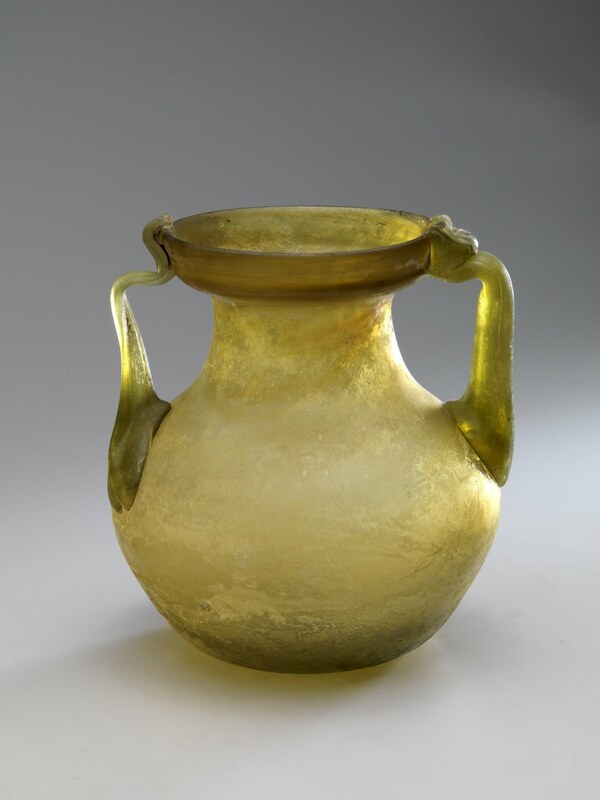 Reference: Roman Glass in The Corning Museum of Glass – Vol. I (D. Whitehouse, 1997), no. 196 and no. 197. Origin: Eastern Mediterranean, Cyprus, 3rd – 4th century AD. Dimensions: ­7 cm. ; foot ø 4,5 cm. ; cuppa ø 8,5 cm. ; weight 36 gram. Drinking glass made from light olive green glass. This free formed glass is, as it looks like, made from one piece (gather) of glass. The hollow stem is “pulled” from the almost cylindrical body of the glass and than splayed out forming the small diameter foot having a rolled in rim. The mouth of the glass is also rolled in and has a very smooth finish. A very small pontil is visible. In the hollow stem a little earth deposit. Published: -“De Oude Flesch” nr. 124 (2011), pg. 14, – Catalogue “Romeins glas uit Particulier bezit”, Thermenmuseum Heerlen 2011, nr.60, page 47. Provenance: – ex collection Niemeijer-Huysse, acquired in 1978 from Frides Laméris, Amsterdam, – acquired by present owners from Archea, PAN Amsterdam. Exhibited: – Allard Pierson, see movie with Prof. Isings showing this or a very direct parallel of this glass. – “Romeins glas uit Particulier bezit”, Thermenmuseum Heerlen 2011. Description: Transparent amber colored glass, low-bellied and pear-shaped body, tapering to a narrow cylindrical neck, wide flattened mouth and rim folded inward. The base pushed in and tooled to form a hollow tubular base ring, rest of pontil. Handle of olive green glass, applied on the lower part of body, drawn up, making a construction and attached to edge of rim at right angle. Characteristics: a narrow neck, a bellied body and one or two handles. (Hilgers 1969) It is fascinating to see how the glass blower worked with too much glass for the handle, more than he needed but he used it all. H: 3.8 cm, D: 9.00 cm, Thickness rim: 0.39. cm, Bottom: 0.32 cm, Isings form: 1. Technique: Mouldpressed, or sagged, hemispherical bowl; from a convex mould; wheelcut line underneath the rim into the same glass pattern. Description: Hemispherical bowl, i.e. 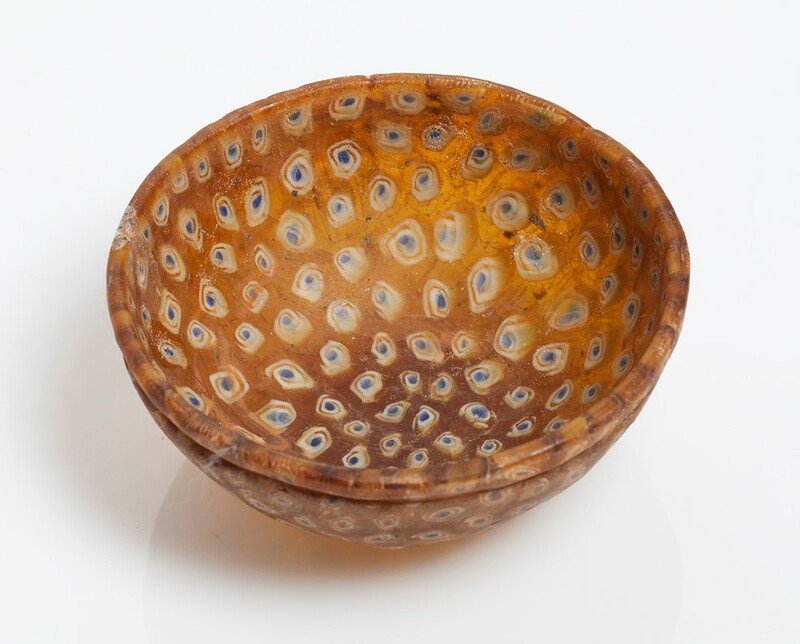 convex curving side and convex bottom; mosaic pattern formed from polygonal sections of a single blue bar as the centre, with an opaque white spiral surrounded by an amber coloured field that joins the other intersections with visible lining; rough wheelcut rim, slightly polished; one wheelcut groove at approximately 0.85 cm below the rim. Condition: Complete and intact; polished; surface pits and remains of iridescence and weathering on the inside and outside. Remarks: The rim is not finished with a coil of a different pattern, which might indicate an older date, or a primitive approach in technique. Provenance: From a dutch collection. Said to have been aqcuired in Sicily, Italy. Reference: Isings, 1957, form no: 1, p.15, Olivier, 1968, Millefiori glass in classical Antiquity, p.65, n.4, Slick-Nolte/ Stern, 1994, Early Glass of the Ancient World, Ernesto Wolf Collection with elaborate explanation on the technique.